Strong storm with hail hit on Auvil farm around midnight on July 17th. It caused huge damage on cherries right before the crop date. 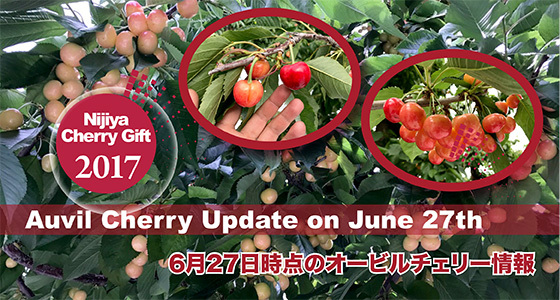 Under the current circumstances, it is almost impossible to prepare new batches to Japan except R2 and RB1 which had already arrived to Japan… We are now preparing alternative products as soon as possible, and we will contact you early in the next week if you purchased R1 or R3. June 28th for all stores. If you have any questions, please contact our staff. Limited sales of Premium Rainier Cherries from the Auvil Farm. Limited sales of Premium Dark Cherries from the Auvil Farm. 2 kinds of premium cherries from the Auvil Farm. Large sized Dark Cherries with a sweet taste. Set of Rainier Cherries and Dark Cherries.